ENCINITAS — This past Sunday night, multiple Jedi, Chewbacca and Princess Leia faced off against storm troopers and Darth Vader. The saga played out — not on TV or movie screens — but a Magdalena Ecke YMCA soccer field. The six-on-six match of Star Wars characters was held to raise money for 12-year-old Micah Hogan, who has Duchenne muscular dystrophy (DMD), a degenerative muscle disease. 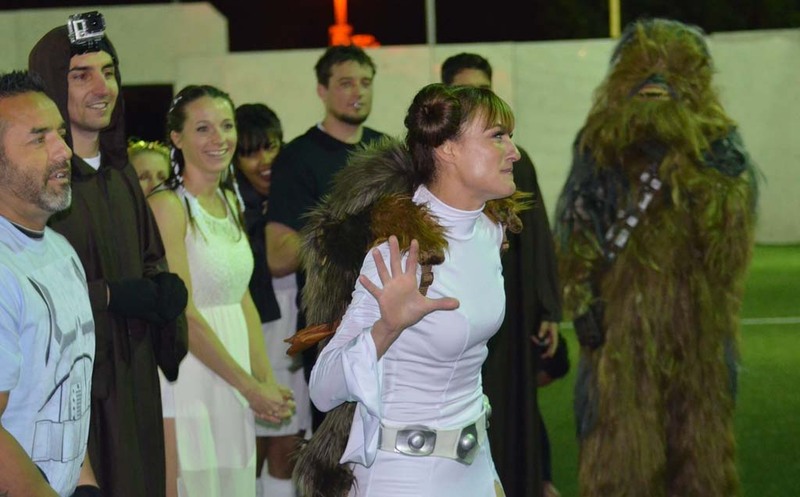 Donning a Chewbacca costume, Christian Hogan, Micah’s dad, took part in the game. The novelty of a Star Wars game was an added bonus, said Christian, who scored a goal during the match despite the limited vision his furry mask afforded him. The shot drew plenty of “Go Chewie!” cries from the crowd. A Jedi uses the force to move a soccer ball toward the opposing goal. Micah, who was diagnosed with DMD just before his 4th birthday, waved a lightsaber and clapped from the sidelines. Because of the disease, Micah’s muscle cells are easily damaged. Those with DMD are typically bound to a wheelchair by age 12, have heart and lung problems in their teens, and only live into their late 20s. Micah largely gets around in a motorized scooter, but he can still walk. Although his parents dress him and assist with other routines, he attends school and can perform other tasks on his own. The future, though, is uncertain. Christian compared DMD, which occurs in one out of every 3,500 male births, to a small hole in a large bag of water. Slowly, Micah is losing crucial substances from his muscle fibers. Once a year, Micah and his parents go to a clinic to gauge his muscle strength, flexibility and bone strength. Based on the results, doctors recommend ways to ease the symptoms of DMD. Still, water continues to drip from the bag. To date, there isn’t a cure or a silver-bullet treatment for DMD, though steroids can help. For Christian, that’s the most frustrating part. “You can’t give your kid medicine or a Band-Aid to fix this,” he said. Recent studies indicate there could be hope for treating and potentially curing DMD. In the past year, there have been breakthroughs in experimental gene therapy, for instance. Which is why it’s crucial, more than ever, to funnel money toward DMD research, Christian said. “If it gets to the point where he’s not walking anymore, but they’re close to finding a treatment or cure to help him live longer, that would be amazing,” Christian said. Initially, the Star Wars game was conceived as a surprise birthday party for Eric Castillo, who is Christian’s good friend and teammate on the soccer team. Because Castillo has a long tradition of supporting muscular dystrophy, another teammate, CJ Machado, decided the match would also be a good opportunity to benefit Micah. Machado then went about finding the costumes and was able to get director Adam Cosco and his film crew to document the match. She intends to share the footage of the event through Love Amazingly Productions, her production company, with ESPN and other news agencies. She’ll also post the video on YouTube. “Our goal is to raise awareness of Duchenne muscular dystrophy to more across the world,” said Machado, who wore a Princess Leia costume. She envisions the Star Wars soccer game becoming an annual event. “Sometimes, you need laughter to get through something as tough as this disease,” she said. Star wars characters line up for a group shot after a soccer game at the Magdalena Ecke YMCA soccer field this past Sunday to raise money for Micah Hogan (front), who has Duchenne muscular dystrophy. For his part, Micah was overheard calling the event “fun.” However, he was reluctant to answer questions; his dad noted he generally shies away from the spotlight. Christian and Micah’s mom, Denise Hogan, have participated in other benefits for their son. Denise Hogan has run seven half-marathons — the first being not long after Micah was diagnosed. And Micah’s 10-year-old sister, Samantha, got in on the act by completing a 5K last year. “Doing something to help him saved our lives, our hearts, our spirits and helped us move past that initial desperation we had,” Denise said. The family will all be running in the Disneyland Marathon Weekend next August to raise funds for Parent Project Muscular Dystrophy, which funds DMD research. Their goal is to reach $10,000. Donate to the Hogan family at www.parentprojectmd.org/goto/micahsmiles. To learn more about DMD, go to www.parentprojectmd.com.